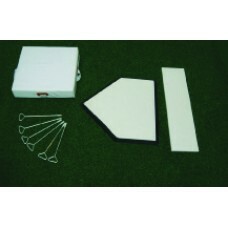 The softball plate consists of the home plate, the pitcher plate, and 4 double slide bases. Three of the double slide bases are white, where one is colored orange. These slides bases are fixed with ground anchors in the ground. The home plate and the pitchers plated are fixed with spikes to the ground.